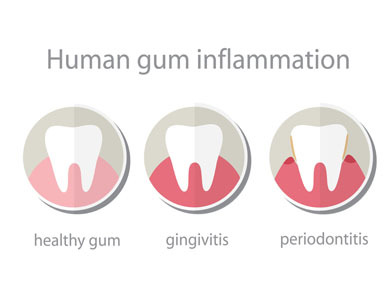 Infections around the tissues that support your teeth are known as gum disease or periodontal disease. They are one of the top causes of tooth loss as people get older. It is caused by the sticky bacteria film that forms in your mouth known as plaque. There are many people walking around with gum disease who don’t even realize it because it is typically painless. Gingivitis: This is the first stage of periodontal disease. At this stage, the effects of gum disease can still be reversed. Periodontitis: This is the second stage where the fibers and bones that hold your teeth in place are irreversibly damaged. 3.Advanced Periodontitis: At this final stage, the fibers and bones that hold the teeth in place are destroyed, leading to loose teeth. However, you can minimize your odds of getting the periodontal disease by practicing good oral hygiene. It’s always best to use an antibacterial toothpaste and mouth rinse. The key to keeping this disease away is removing plaque from your teeth and gums often. If you already have a dental plaque in your mouth that has been hardened into tartar, you will need a professional cleaning done by a dentist. That’s one of the many reasons why it’s so important to visit a dentist at least twice a year. That way, if you end up with gum disease, you can start treating it in its early stages before it gets worse. If your case of gum disease is already past the tartar stage, your dentist will remove debris, tartar, and plaque from below and above your gum line using an ultrasonic device and hand scales. Your dentist might also decide to use a laser to remove tartar deposits on your teeth. If your case of periodontal disease is on the more severe side, you might need to undergo gingival flap surgery. This is generally reserved for cases where periodontal deposits are over 5mm deep. Lost bone tissue is also restored during this process. Gum disease can be prevented with proper brushing and flossing, but if you end up with it, it’s not the end of the world. The first step is recognizing the symptoms of gum disease, then scheduling an appointment with your dentist to discuss your options.